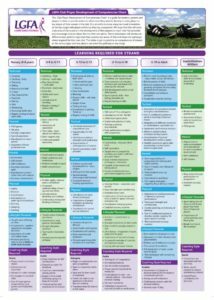 The LGFA ‘Club Player Development of Competencies Chart’ is a guide for mentors, parents and players in clubs to provide advice on what areas they need to develop in every player at key stages of their careers in the club. It is aimed to increase enjoyment and stimulation at the key stages with player welfare as they key component. We hope that this will assist clubs around the country in the development of their players to reach their full potential and encourage clubs to adapt this into their own plans. Teams and players will develop at different rates and it is important that coaches are aware of this and adapt the pathways where required for their own club. The attached is just a guideline on competencies of players at the various ages and new players can enter this pathway at any stage.